When our designer, Chan Luu, was a little girl growing up in the Vietnamese coastal town of Nha Trang, she felt keenly the sensory influences of shape, form, and color. They affected her emotionally, viscerally. She liked to do things with her hands. She explored. She painted. She wanted to be an artist. At the time, Vietnam was a country ravaged by war. It was a war that affected the countryside and the borders more than the cities and the seaside towns, the sort of environment in which Chan Luu lived. Yet while it rarely touched her directly, it created an omnipresent impression and left a lasting effect. When she was nearly 18 years old, Luu’s family moved to the United States, a trip that required her to leave her homeland in virtual secrecy, via Hong Kong and Honolulu, finally arriving in a Boston that reminded her of England. There she went about the business of adapting to life in a new place, with a new language and a new cultural framework. Chan’s unique blend of qualities—her work ethic, her determination, her innate sense of style, her never-say-never mindset—have helped her shape a career that is as subtle, sophisticated and colorful as the products that she makes today. She has done all sorts of things, from running a coffee shop, to working as a sales assistant, dressing celebrities, buying fashion, to managing her own retail store. And much of that was done while studying fashion, managing on a tight budget, and navigating the waters of a new life in the US. Any one of these things alone is enough of a challenge, but combined require a very specific commitment, a higher faith that things can work, challenges be overcome, dreams realized. Chan’s story is inspirational. Her change of career from fashion retail owner to jewelry designer was the result of a freak skiing accident that left her, with a torn ligament, musing over what to do. And so a bedridden whim to string beads together was the beginning of the Chan Luu design company. But it is the cumulation of all her experiences, her pragmatism, and her unceasing resourcefulness—what she calls ‘survival skills’—that helped her move through the early challenges of meeting large orders, organizing production, dealing with management issues, in an industry for which she was neither trained and nor certain would offer a suitable niche. As always, it was the combination of her style, ingenuity and conviction that determined her success. “Creating is like exercising. The more you do, the more you can do.” But you have to believe, and you have to see opportunity. Chan sees opportunity and finds inspiration everywhere, but more often than not she finds it in the people on the streets, people just going about their daily lives in cities as remote as Istanbul and Saigon and Jaipur—or maybe in the middle of nowhere. Her inspiration can come from the pattern in a piece of clothing or a decorative art that she then takes away and reworks to give it contemporary expression and meaning. As a painter, she is able to see the potential in things that the untrained, less sensitive eye cannot. As a businesswoman, however, she is also a realist, recognizing that everything has its time and place, that demand is fickle, that pricing has to be just right or there is no value at all. 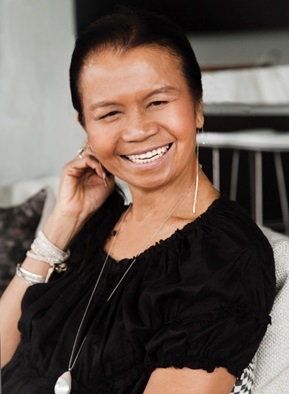 All Chan’s jewelry is produced by artisans in Vietnam and India, with whom she has been working for many years. 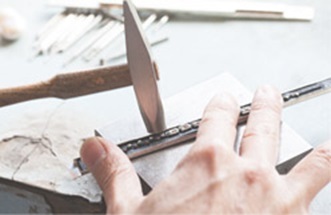 They perpetuate the long-standing traditions that are a vital part of the authenticity of every piece of jewelry produced. And Chan connects with them. She is happy that the work they do together does more than keep them busy, but also feeds them and changes their lives. She sees it as a dance between two people, two groups; a dance of creation and collaboration that has not only beauty, but dignity and integrity too. Chan’s ‘dance’ produces a range of jewelry created with that same intuitive response to the trio of color, form and shape that spoke to her in her childhood on the seashore of Nha Trang. Her collections range well beyond the world-famous wrap bracelet: as well as her complete jewelry range, she also designs cashmere scarves and wraps, sequined lamé-style bra tops and sheer blouses. Her collection is ever-evolving, and while her workforce is large and highly networked, her original commitments do not alter: hard work matters; people matter; intuition is invaluable; belief is critical. If you think you can, you can. But always be original.